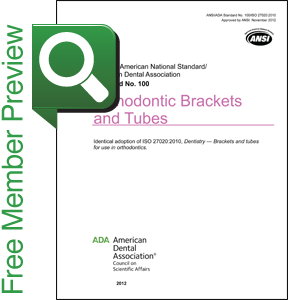 (ALLOWS 14-DAY READ-ONLY VIEWING) This standard is applicable to brackets and tubes for use in fixed orthodontic appliances. This standard gives details of methods to compare the functional dimensions of orthodontic brackets and tubes, the test methods by which they can be determined, as well as packaging and labelling information. This standard does not specify specific qualitative and quantitative requirements for freedom from biological hazards; which are covered in ISO 10993-1 and ANSI/ADA Standard No. 41.